In 1999 the British pop band The Divine Comedy released one of their most successful singles ‘National Express’. Secreted away as a B-side on the second CD single was a wonderfully wry and affectionate Noël Coward pastiche ‘Overstrand’. ‘Overstrand’ told the story of a Londonite coveting a well-to-do address in the metropolis to such an extent that he is willing to pimp himself to a ‘dirty old man’, murder a young woman in the Thames or even write for the Evening Standard in order to get his ideal, bourgeois home. Neil Hannon’s clever take on Coward marks out a clear link not only to a tradition of British comedy songs that have their roots in music hall, but he also connects himself, if somewhat archly, with a dandified persona that manifests itself throughout British popular culture, and British popular music specifically. This persona is ambiguously gendered, complexly articulated, and above all, somewhat artificial. While Hannon’s voice might be understood in this particular instance to be not entirely his own (the exaggerated upper-class accent along with the arrangement and word play make the most visible links to Coward), it is the very level of artifice that marks him out as a dandy, through association and application. Such an identity is not merely manifest in this particular song; Hannon has consistently played the effete dandy, most obviously through the Casanova (1996) album, and within popular music more generally he is far from alone. Masculinity, authenticity and display are all problematised by the dandy figure within popular culture, and nowhere more so than within the realm of pop music. Stan Hawkins’ The British Pop Dandy seeks to address the persona of the dandy within British popular music, forming a historical lineage that ranges from the dandies of the 18th and 19th centuries (‘Beau’ Brummell, Jules-Amédée Barbey D’Aurevilly, Charles Baudelaire, Lord Byron), through Noël Coward, Oscar Wilde and Cecil Beaton to more contemporary manifestations within British popular music such as The Kinks, Marc Bolan, David Bowie, Adam Ant, Morrissey, Justin Hawkins and Pete Doherty. In all of these manifestations, Hawkins argues, lies a complex negotiation with masculinity that goes some way to challenge heteronormative behaviour through a queering of gender representations. These negotiations are evident in the spectacle of the pop performer, through image, dress, movement, video and performance, as well as in the manifest qualities of recorded music, in such a way that fans are able to identify the pop star as dandified, arch and queer. As such the dandy persona assumes a political instability and subversive potential that needs to be addressed. Hawkins commences his study of the dandy by providing a historical context out of which the dandified persona in British popular music develops. This context is post-industrialised society. The dandy represents a stylised form of spectacle that particularises the individual, from both society on a broad level and from conventional notions of gender and identity on a more specific level. As such the dandy is both artificial / cultured and organic / natural. Hawkins proposes the stylised display of the dandy as a means of articulating subjectivity, at once both negotiating ‘glamour and depth simultaneously’ (17). This identity is played-out through performance and as such constitutes a mobile category that has as much to do with the audience’s reception as it does the artists’ intentions. One of the means by which the dandy performs out his identity is through a mediated recorded form, whether that be the record, video or television appearance, and it is the means by which the agency of the dandy is acted out through the recorded performance that articulates his identity. As such the dandy persona both prioritises the artifice and construction of identity while at the same time working as a strategy to delineate the pop performer from others as a ‘true’ individual. The media acts as the means by which such strategies are made to occur, and are the focus of subsequent chapters in Hawkins book. Hawkins goes on to explore some of the influences that might come to play in constructing the spectacular dandy persona in British popular music. Particularly Chapter two develops audio-visual texts as the means by which subjectivity in pop might be articulated. Genre, for one, becomes a discourse against which gendered subjectivities might be judged. Audiences negotiate musical texts to make meaning from an interpretive process, one that the dandy plays upon self-consciously. Further, the dandy presents a naivety of performance, showing off to display the ‘real me’ underneath. Often this is done through discourses of national identity, particular articulations of cultural identities that separate out the star from others and engages with the specific preoccupations of the audience. For Hawkins this revelation of identity through a spectacularised subjectivity is not merely the domain of one individual, but part of a collaborative process that involves songwriters and producers that help to fashion the persona projected through the audio-visual text. The aim of this process is to mediate temperament (an important classification of the body through display for Baudelaire, whom Hawkins uses extensively to frame his theorisations) through physical performance. In this way the temperament of the artist is displayed through a naivety of performance. Using The Kinks as a starting point, Hawkins shows how Ray Davies’ particularly British sensibility, articulated through the mod display of style and a colloquial approach to story-telling and music making, mark out not only a dandified persona, but one that is aware of its own contradictions and limitations, a quality, Hawkins proposes, that is essential to the dandy persona, a self-reflexivity that is arbitrated through performance styles. Chapter three goes on to explore the relationship between authenticity in performance and the self-aware spectacularisation of the pop dandy. At the heart of this process is a knowingness about being looked at, becoming the object of desire. Hawkins uses the audio-visual performances of Robbie Williams and Jay Kay of Jamiroquai, Morrissey, The Pet Shop Boys, Adam Ant, Robert Palmer and Robert Smith of The Cure to illustrate the variety of performative strategies that are available to the pop dandy. All of these strategies engage with and renegotiate heteronormative behaviour through bodily performance. The immanence of the musical moment acts as a means by which the dandy invites a peculiar or particular reading of his subjectivity, whether it be through the ‘chauvinistic’ masculinity of Robert Palmer or the withdrawn sexuality of Robert Smith. The voice particularly acts as a marker of intimacy and seduction, positioning the performer in gender terms that invite the listener to engage with their subjectivity in very specific ways. Hawkins’ close readings of musical texts such as Williams’ ‘Rock DJ’ video or The Cure’s ‘Just Like Heaven’ engage with musicological strategies that mark out the dandy’s specific ‘identity’ as it is mediated through performance. Hawkins seeks to theorise the nature of the dandy’s performed gendered identity in chapter four by situating dandyism as an acting of queering. Hawkins delineates the act of queering within popular music as a means by which opposition to and compliance with heteronormative ideals are worked out through performance. In this sense, while the dandy persona may be a means through which agency and subversion are manifested, it is forever governed and defined by heteronormative conventions that give it shape. Hawkins strength here is that he highlights the fluid way in which masculinity is defined across space and time, thus also illustrating how the dandy persona must respond to that discourse. Again, Hawkins’ musicological framework (albeit a framework that is only part of the analytical matrix that he uses to understand the British pop dandy) illustrates the manifestations of a queer temperament in the recordings of Pete Doherty, Marc Almond and David Sylvian. These articulations range from the kitsch and camp to the more ambiguously gendered. However, all of these manifestations are open to a variety of interpretations and historical contexts, hence Hawkins’ recourse to queer theory to reveal the complexities of the performance of gendered identities. The penultimate chapter focuses specifically on the vocalised performance and vocal techniques that impart temperament and subjectivity. This is not merely a case of analysing vocal performances and strategies, but to also consider the role of the recording process in creating such performances. Here the narrative function of the pop voice is contextualised in very specific ways providing a constructed ideal-self that is ideal to the intentions of the pop dandy. Hawkins again takes specific musical moments (David Bowie’s ‘Slip Away’, Mick Jagger’s ‘Hideaway’, Morrissey’s ‘At Last I am Born’, The Darkness’ ‘I Believe in a Thing Called Love’, Robbie Williams’ ‘Millennium’, Bryan ferry’s ‘Don’t Stop the Dance’, Babyshambles’ ‘Albion’, Mansun’s ‘Wide Open Space’ and Pulp’s ‘Common People’) to show how a mannered or stylised vocal line married to the peculiarities of production provides a means by which the dandified subject might be imparted across the audio text. Implicit in this is the assumption of specific responses on the part of the listener, shaped by discourses of musical competence and gender that bring the dandy to bear. In many ways this is Hawkins’ most successful part of the book, providing beyond the chosen examples a means by which subjectivity and the voice in popular music might be regarded. Hawkins’ final chapter develops his work on the voice to show how stylisation, masking (the making artificial of the body through production) and a relationship to virtuosity both make visible the constructed nature of the pop performance, and at the same time, give listeners access to the ‘real’ performer through the construction of the dandy subjectivity. Here one might be able to extrapolate Hawkins conclusions to other forms of gendered identity, as the body becomes the locus for the manifestation of performance in the musical moment. Again the tensions between a ‘real’ performer and the manifestly artificial construction of that identity are highlighted by Hawkins, forming the crux upon which the dandy persona hangs. It is through the presentation and performance of the artificially natural that British popular music engages with listeners and makes subjective possibilities for the pop performer. One might well be suspicious of any attempt to theorise any form of identity from such an ambiguous term as ‘dandy’, yet Hawkins’ work provides a clear lineage throughout British popular music, that specifies certain forms of spectacular masculinity. As such his subject is relevant and fascinating, providing a means by which masculine display and subjectivity might be understood. Of course, as Hawkins is keen to point out, the dandy not only opens up possibilities for understanding other queered identities (and not only masculine ones), but for understanding the performance of identity more broadly. Hawkins work has always embraced the liminality of identity performance, and he would seem to be one of the leading developers of the work of Butler, Kosovsky-Sedgwick and others within the realm of popular music studies. 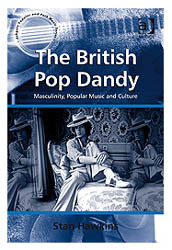 While The British Pop Dandy might not be as exhaustive or as comprehensive as it might be Hawkins provides a range of identities and strategies of identity that say much not only about the British pop dandy, but about Anglo-American pop culture itself, and provides a means of theorising identity that is only becoming ever-more relevant to the field.